We spent a leisurely morning checking the internet and email. In the early afternoon, we got a snorkel trip lined up for Sunday. Then we set out to find Playa Hermosa. Not too exciting. When we found the beach, an aging hippy materialized from nowhere and demanded money to park on “his beach” so we just left. When we first came down, I wanted only carryon baggage because our flight times were so tight and there wasn’t much time in New York to get from one terminal to another. I also hate paying checked baggage fees! JetBlue doesn’t have them but our flight from DC to NYC does. So…we didn’t bring some stuff we would normally bring to a place like this, like snorkel, mask and especially fins. There is no way I will use a snorkel they provide as a loaner. I’m ok with mask and fins but not snorkel. So, we spent the rest of the afternoon in dive shops around looking for two snorkels. The price we paid for those was more than we would have paid for the checked baggage to bring ours from home in. Oh, Well. There was still the time in the airport to consider. 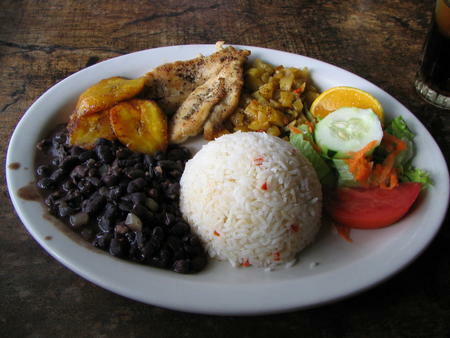 As I mentioned earlier, beans and rice is the basic variable in almost all Costa Rican cuisine. A typical meal is the casado, the name referring to the eternal “marriage” of its components. Consisting of rice and beans, meat or fish, fried plantains, and a carrot, tomato, and cabbage salad, this basic and well-rounded meal strikes a good nutritional balance. The plantain, or plántano, is the typical Tico (Costa Rican) snack. It looks like a large banana, but can’t be eaten raw. It is sweet and delicious when fried or baked, and will often accompany most meals. When sliced thinly and deep fried, the plantain becomes a crunchy snack like potato chips. Arroz is a dish of fried rice which may be offered with chicken (pollo) or shrimp (gambas). For breakfast, it is common to be served a hearty dish of black beans and rice (gallo pinto) seasoned with onions and peppers, accompanied by fried eggs, sour cream, and corn tortillas.